Product information "Marshall Tufflex RWKO2 Stopend Outlet (Right)"
* Above illustration shows left-hand outlet but dimensions are the same for this right-hand product. Compatible with Eurocell and Wendland conservatories! Stopend outlet from Marshall Tufflex for closing right-hand side and providing outlet for downpipe. Part of Universal System Plus for light commercial and residential properties. 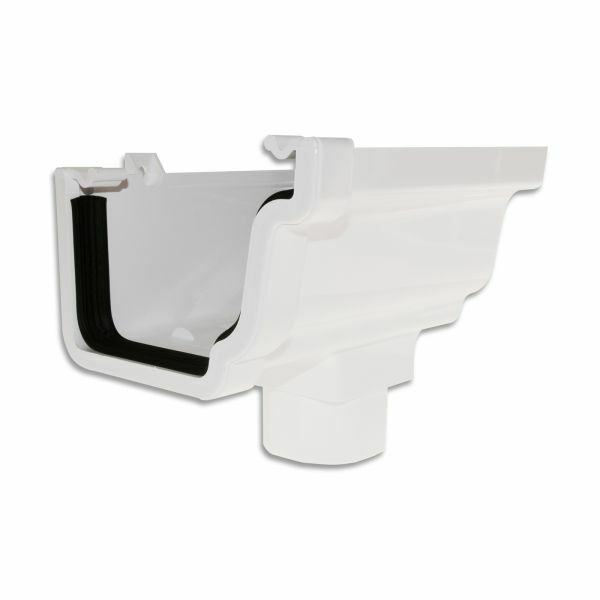 Fit the popular Ogee profile of Marshall Tufflex RWKG4 guttering and should not be confused with the other forms of Ogee guttering, which although similar may have different dimensions. To be certain that this stopend outlet is compatible with your guttering, please check Technical Information. What side do you need? To determine whether you need left or a right, just stand in the garden looking back at the property. If the unit that you want to replace is on the left as you look at it, then it's a left side you need, otherwise a right. Related links to "Marshall Tufflex RWKO2 Stopend Outlet (Right)"
Customer review for "Marshall Tufflex RWKO2 Stopend Outlet (Right)"